We all know that a Lambic Style beer has lots of interesting flavors. Sour, vinegary, earthy, barnyard, and other flavors not normally found in other styles are appropriate and even desired in a Lambic. These flavors and aromas come from a large assortment of yeast and bacteria—to make one, the brewer needs to make sure that the fermenting beer has them and the necessary food to keep them healthy. It clearly matters that one has the right wort readyh when starting fermentation. Ideally, you would perform a turbid mash—a classic technique that Cantillion uses which is readily available on the net. A quick summary is that it takes about three hours, involves lots of “decoction like” temperature increases of the liquid wort, and it results in a very starch-rich wort full of long chain sugars that aren’t fermentable by beer yeast. The wort coming off the mash is very thin—plan on a three hour boil to concentrate it to 1.050. An easier way would be to use a high starch single infusion mash. You want the mash temperature to be high; 154-158 is ideal. The wild yeast and bacteria need food that your beer yeast can’t digest; and the dextrins and other long-chain sugars that are produced in a hot mash fit the bill. Be sure and use a fair amount of unmalted wheat and even some flour. Same reason—Sach. Yeast can’t digest it; but other bugs can. Many pe ople who make Lambics use a mixed bacteria-yeast mix. Both Wyeast and White Labs make them. East Coast Yeast has one that is appropriately called “bug farm”. They work, but not as well as staging the fermentation regimen. Around 15 years ago, long-time Maltose Falcon and yeast expert MB Raines took a bunch of us new brewers under her wing and taught us Lambic Fermentation. Drew Beechum, Cullen Davis, Jim Moorman, Doug King, and I were included in the group. One thing she stressed was that each of the microbes work at a different time and each requires food. And the order does matter. Since MB is a microbiologist, was the founder of Brewtech Yeast, and has a yeast bank of hundreds of different strains one needs to listen when she talks. Start with a neutral ale yeast. If you want to stay Belgian, a “clean” yeast like White Labs 570 works great. It is a low phenol and ester producer and “clean” for a Belgian. Any clean yeast that doesn’t finish dry should work, even common yeasts like White Labs 001 and Wyeast 1056 will work. A month later pitch Pediococcus Damnosus. The Pedio first produces a buttery diacetyl flavor, but it gets absorbed and takes on a lactic sour character. Sort of like Lactobaccilus with attitude. No need to feed the yeast at this point, the starches left over in the mash should provide any necessary nutrients. The Lambic style is fairly broad. It can include Straight Lambics (unblended), Guezes (blended), Faros (added sugar), and Fruit Lambics. If you are making a fruit lambic or faro, you may want to add some fruit or sugar now. For example, my current lambic hopefully will be a Kriek in a few years. I added a bottle of Trader Joe’s sour cherry “Just Juice”. The main feeding (if you desire) will occur in two months. That is when we’ll pitch Brettanomyces strains. Both bruxellenis and lambicus or both are good options. The bruxellenis produces wet hay, earthy, barnyard flavors and aromas and the lambicus produces more smokey, horsey, and phenolic notes. I had the good fortune to judge sours with Professional Brewer Andrew Bell (he’s in charge of research and experimental brewing a the Bruery). I took notes. Both produce sour flavors and aromas. The brewer can find other strains of Brett. to get other interesting flavors. Again, the straight Lambic brewers can probably get away without feeding the Brett. These yeasts will eat the yeast which probably has undergone autolysis, as well as digesting some sugars and starches which the Pediococcus couldn’t digest. The Brettanomyces will pretty much eat anything. The final beer will be quite dry in spite of the high mash temperature. For those adding fruit, now would be a good time to add it. You’ll need a lot; five gallons will take 5-10 pounds of fruit. Get the most flavorful fruit you can find. For example, if your making a Peche, don’t get frozen peaches or supermarket peaches—find someone with a peach tree. You want the fruit at peak flavor; not at peak sweetness. I sometimes use peaches; and pick mine before they are completely ripe and freeze them for later brewing use. For my Kriek. I’m planning on using sour Michigan Montmerency cherry juice in a concentrated form. King Orchard’s juice makes a wonderful melomel with an intense cherry character; I’m going to use an entire bottle in my lambic. It needs to be diluted first, otherwise the beer will end up too big. Yet, the Brett. will power through it given enough time. I’m going to skip the final optional steps. A lambic also can have some acetobacter. No thanks. I think vinegar belongs on salads. Plus, it seems to happen on its own given enough time. Acetobacter is everywhere and eventually some will find your lambic and it will eat the alcohol turning it into a hot vinegar. I’ve dumped a few in my day. Another option would be to barrel age (not oak chip) the beer. Yes, you will pick up interesting flavors as the beer breathes through the wood. But that’s the end of that barrel for anything else. Everything that touches my lambic after the Pedio pitch is dedicated to sour beers. Fermenters, Corneleius tanks, fittings. The key thing is patience. The lambic really won’t be even approaching its peak for at least a year. Most lambics are at their best in years 3-5 IMO. If you rush it and drink the beer early; yes it will be an interesting sour. But you’re still missing out. Homebeer.com thanks John Aitchison for this article. Many Belgian beers have sugar as one of their ingredients. The sugar percentage can easily reach 25% or more of the total fermentables in some beers. When fermenting a high gravity beer th at has a lot of sugar, it is important to help the yeast along and get as clean and complete fermentation as possible. Table or cane sugar is made up of sucrose. Sucrose is a disaccharide; it has one molecule of glucose and one molecule of fructose. It must be broken apart into those molecules before the yeast can metabolize or eat them. An acidic boil will usually break most of the sucrose apart but the wort pH must be acidic for the invertase to form. If one uses lots of sucrose and it doesn’t invert; the resulting beer can stresses yeast; cause an incomplete fermentation and result in a sweet beer. 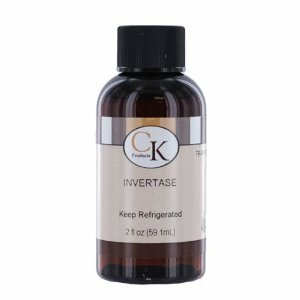 Invertase is a readily available enzyme which breaks down the table sugar into glucose and fructose. You can find it on Google, Ebay, Amazon, or in some candy making stores. Unless you brew as much as Beanie (he inverts), your cost will range from about 5 cents to 50 cents per use (depending on how much sugar you invert). All you have to do is dissolve 1 pound of sugar into 1 gallon of water. Heat the water to 140 degrees and lower the pH to the 3.5-5.5 range. Lactic acid works well for that. Then add invertase at the rate of .05 oz per pound of sugar. Let it sit for 30-45 minutes and you’re done. I usually invert my sugar a few days before I brew. After the inverting process is done, I’ll boil the sugar down to concentrate it. You can easily concentrate 5 pounds of sugar into a gallon. When you get to the 8 pounds per gallon level, the sugar will start to caramelize. Great for Dark Strong Belgians, but you better turn down the heat or you can scorch it. The longer you go, the hotter the sugar mixture gets and the darker and richer the caramel becomes. I’ve found that if you add boiling water to the caramelized sugar before it hardens, it is easier to store and brew with. Do it slowly. When I’m done inverting and concentrating/caramelizing my sugar, I’ll just pour it into a gallon glass jar and cap it. No need to refrigerate it. When brewing, just add it to the boiling wort.